Cocoa, Natural and Artificial Flavors, Soy Lecithin, Sucralose, Acesulfame Potassium and Neotame. Contains milk, soy, egg and fish (herring, anchovy, mackerel, sardine, salmon). Contains milk, soy, egg and fish (herring, anchovy, mackerel, sardine, menhaden, smelt, tuna, sand lance, salmon). Natural and Artificial Flavors, Soy Lecithin, Sucralose, and Acesulfame Potassium. Contains milk, soy, wheat, egg and fish (herring, anchovy, mackerel, sardine, salmon). Chocolate Cookie Pieces‡, Natural & Artificial Flavors, Soy Lecithin, Sucralose, Acesulfame Potassium, and Neotame. ‡Chocolate Cookie Pieces Ingredients: Sugar, Enriched Flour (Wheat Flour, Niacin, Rreduced Iron, Thiamine Mononitrate [Viamin B1], Riboflavin [Vitamin B2], Folic Acid), Partially Hydrogenated Soybean Oil, Cocoa (Processed with Alkali), High Fructose Corn Syrup, Baking Soda, Cornstarch, Salt, Soy Lecithin (Emulsifier), Chocolate, Vanillin. Natural and Artificial Flavors, Soy Lecithin, Sucralose, Acesulfame Potassium and Neotame. Beet Root Powder (for color), Natural & Artificial Flavors, Soy Lecithin, Sucralose, Acesulfame Potassium, and Neotame. No longer is it necessary to buy all your supplements separately. 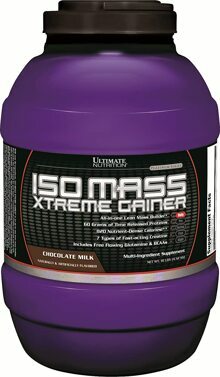 Ultimate Nutrition is pleased to introduce our all-in-one protein supplement, Iso Mass, to "hard gainers" everywhere. Iso Mass is the future of weight gainers. With a scientifically formulated carbohydrate to protein ratio of 16:13, Iso Mass is designed for you to gain serious muscle mass without the added fat deposits. Do Athletes Really Need Vitamin Supplements? Applegate E. Introduction: nutritional and functional roles of eggs in the diet. J Am Coll Nutr. 2000 Oct;19(5 Suppl):495S-498S. Halliwell, B., Free Radicals and Antioxidants: A Personal View, Nutr. Rev. : 52, 253, 1994. Kent KD, Harper WJ, Bomser JA.. Effect of whey protein isolate on intracellular glutathione and oxidant-induced cell death in human prostate epithelial cells. Toxicol In Vitro. (2003 Feb) 17(1):27-33. Middleton N, Jelen P, Bell G.. Whole blood and mononuclear cell glutathione response to dietary whey protein supplementation in sedentary and trained male human subjects. Int J Food Sci Nutr. (2004 Mar) 55(2):131-41.